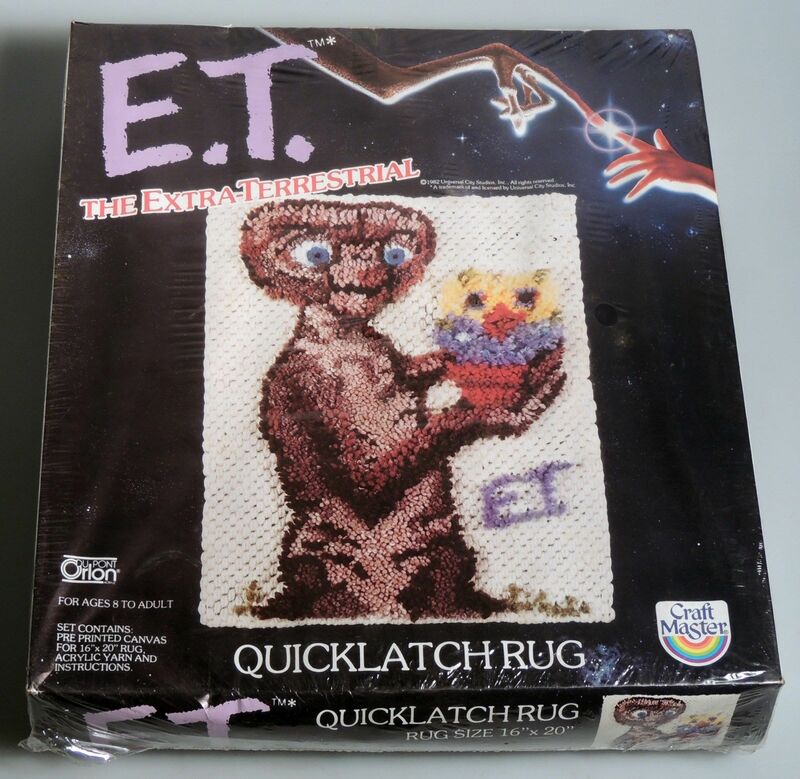 Quick-latch rugs were a thing in the late ’70s and early ’80s, but I’m not sure why. There was a general crafts resurgence, and I remember going to various stores with my mom to buy the rug kits and figurines to paint—there were E.T., Return of the Jedi, and D&D paint-a-figurine sets, among others, and a company called Craft Master was the leading producer. Craft Master was also a leading producer of the Poster and Pen sets unique to our generation. The rug kit came with a color coded template and a latch instrument, and you would take the appropriate strip of yarn with the latch, run it through the correct square, tie it off, and so on until you died from boredom. When finished, the rug was very unfortunately made into a pillow or hung on the wall. I may have completed one of the things before I realized that I was being duped and went back to my action figures and D&D Basic Set. So, it was essentially paint by numbers but took 50 times longer? Count me in! Did you need to supply your own yarn? Because then you could have made E.T. purple or something. Then you would have some art. Basically. The yarn came with the kit, but I suppose you could get some other colors to make things more interesting. Latch hook is still a thing, but other than Disney, the licensed kits are pretty rare now. I like crafts quite a bit, and though I like sitting around and making my own Robotech cross stitch patterns, I’ve gotten and seen some nice pattern books from the 80s of subjects that wouldn’t merit the treatment now, particularly with video games. I don’t necessarily like this kit– the flat background makes E.T. stand out kind of unfortunately, and the yarn colors seem odd– but I’d be thrilled if seeing this kind of craft kit in a store came back into vogue. Robotech patterns? I’d love to see those! I actually found your blog because of your postings about Robotech toys and coloring books, and it’s come to be one of my favorites. The variety of materials that you draw from is really remarkable, especially since it all fits the overall theme so nicely. Allison, I love these. Can I feature them here? If you could give me a description of how you make them, what a sprite is, etc. (for beginners like me), that would be great too. And thanks very much for the compliment. It means a lot to me. I attempted one of these back in the 70s. I never did master the latch tool, so I just hand tied the yarn. I never did finish it. Somewhere I have a Pac-Man Latch Hook kit I got as a kid. I actually kinda enjoyed it, but then I’m into crafts somewhat. Woo hoo. I did one of those things back in ’79 when I was 8-9 yrs. old. It wasn’t anything remarkable though—I think it was just a flower pot or something—but I still stuck it out ’til the very end. I actually liked doing it; it was pretty relaxing somehow. I just found one of these and am selling it on eBay in case anyone is interested. I am so not crafty. 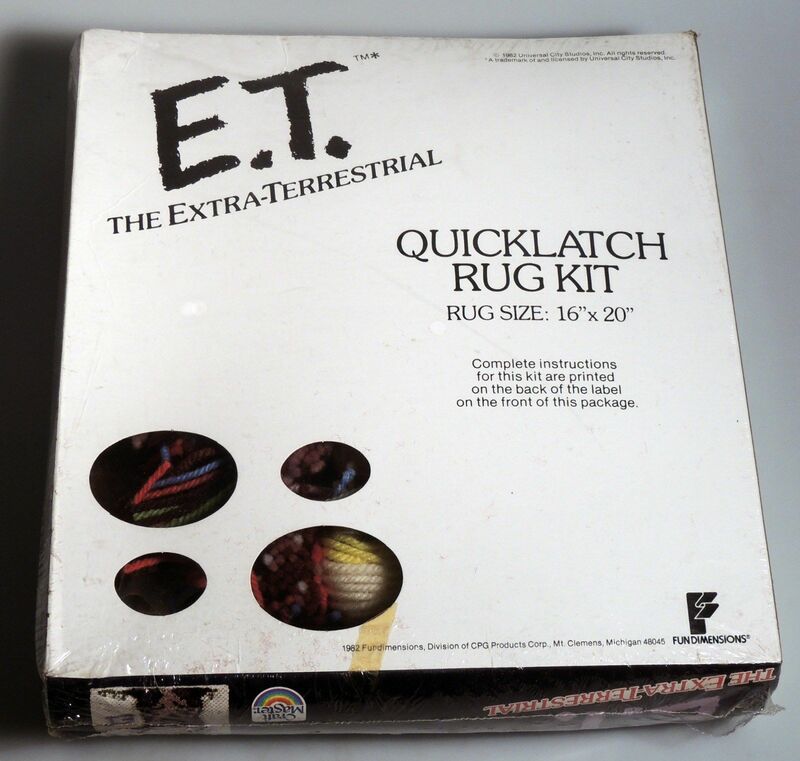 http://www.ebay.com/itm/E-T-Quicklatch-Latch-Hook-Rug-Pillow-Kit-ET-Craft-Master-New-Sealed-39701-/251933175611?